We are proud to announce that this year's competition will be held at the NRG Arena! The main arena features 24,000 square feet of floor space with arena seating for 8,000 spectators, and Hall D features 100,000 square feet of floor space with bleacher seating around each competition floor for up to 1,000 spectators. This larger venue will allow us to accommodate up to 6000 athletes and will feature 5 competition floors, each with a theme from the upcoming and previous Summer Olympic Games. NRG Arena is located at 1 NRG Parkway, Houston, TX 77054. Click here to preview the venue space. Registration opens on March 1, 2019, and will be on a first come first serve basis. There will be no preregistration period for this year's competition, only open registration, and once the competition is filled, additional entries will be accepted on a case by case basis based on availability. 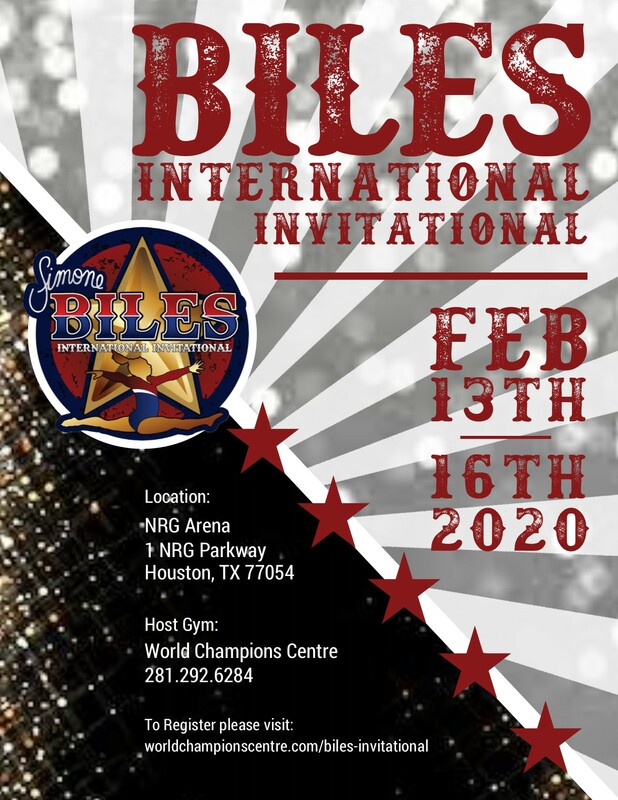 You MUST submit the official entry form provided on this website, along with the print-out from USAG's online registration portal to gain entry to the competition. (official entry form coming soon. We are requiring that gyms complete their registration through USAG's online portal. Once registration has been completed and all athletes and coaches have been registered, please print out a hard copy and mail it along with your competition entry payment to World Champions Centre. Any gym who does not complete the online meet registration process will not be allowed to compete in this competition. Please email our Meet Director at meetdirector@wccgym.com to request entry if you have not already registered for approval which will be based on our current availability by level. If you have already registered through USAG and have not submitted your registration fee, please mail the check to World Champions Centre as soon as possible to guarantee your place in the competition. Checks should be made payable to World Champions Centre. All equipment used during this competition will be supplied by Spieth America. Also, Simone Biles will not be competing in the Elite Qualifier. Tickets available at the door. Child ticket is for 10 years and younger. Seniors 65+ and military (with ID) receive child price for the event. Credit cards will also be accepted. For the Invitational, GK has created another one-of-a-kind Simone Signature leotard for our competition that cannot be purchased online or in stores. You may preorder the leotard for $40, and we will have a limited number on hand for sale in our Proshop during the competition for $50 but cannot guarantee sizes. All preorders and payments must be received by November 30, 2019. Due to the lead time for production, no acceptions will be made. Click here to preorder this exclusive leotard (link coming soon). Please email proshop@wccgym.com with any questions. Preordered leos will be available for pickup at the event from our Proshop. Hotel information coming soon, please check back for more information.